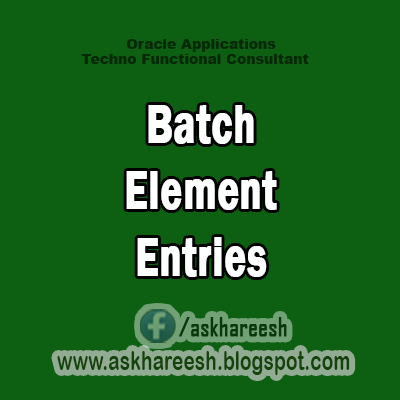 Batch Element Entry is open interface specifically designed for elements. it enables you to make mass updates for assignments and assignment sets for specific elements. using BEE allow you make quick changes to assignment element data. With BEE you can generate new batches using default values . The data will be validated before transferring to the BEE Tables. Data Entry Using BEE Records Timecard Entry,One time payments (Bonus, travel reimbursement) and recurring entries . A Batch is made up of batch headers and batch lines . A batch header can have up to 20 lines.can also use Batch Element Entry Spreadsheet loader to manage the uploads. "HR:Enable Security for Batch Element Entry to Y"